InNote delivers point-of-care prescription insights from CURES 2.0 database, assisting California providers to comply with the DOJ mandate. SAN FRANCISCO, September 20, 2018 – The opioids epidemic and drug abuse have become a huge challenge for the US healthcare. To ensure proper prescribing and administering of controlled substances, the California Department of Justice certified the Controlled Substance Utilization Review and Evaluation System (CURES) database for statewide use. The program mandates healthcare prescribers to consult the CURES database before prescribing a Schedule II, III, or IV controlled substance effective October 2, 2018. CURES was initiated in 1997, and the current CURES 2.0 database was built to provide a scalable environment capable of providing a medium for healthcare providers to communicate. The database maintains a directory of all system users to enable collaboration and integrate with health IT systems. CURES 2.0 requires providers to consult a patient’s activity reports and prescription thresholds before writing off a prescription. While mandatory, experts believe that the database is another data source for physicians and is bound to increase physician workflow challenges. In addition to EHRs, reporting requirements, and patient insights, CURES database could be another source for physician burnout. To assist physicians of California in meeting the CURES compliance and control drug overuse, Innovaccer has launched “InNote for CURES.” The solution delivers key insights from the CURES 2.0 database to physicians within the EHR, right at the point of care, as they prescribe Schedule II, III, or IV controlled substances. We congratulate the Department of Justice and welcome the mandate to consult CURES to control the national crisis that is drug abuse. It's an admirable move to shift healthcare towards a more efficient paradigm. Supporting the same shift, we launched InNote for CURES to make sure CURES doesn't become an additional administrative burden for physicians, and they continue delivering care as seamlessly as possible. 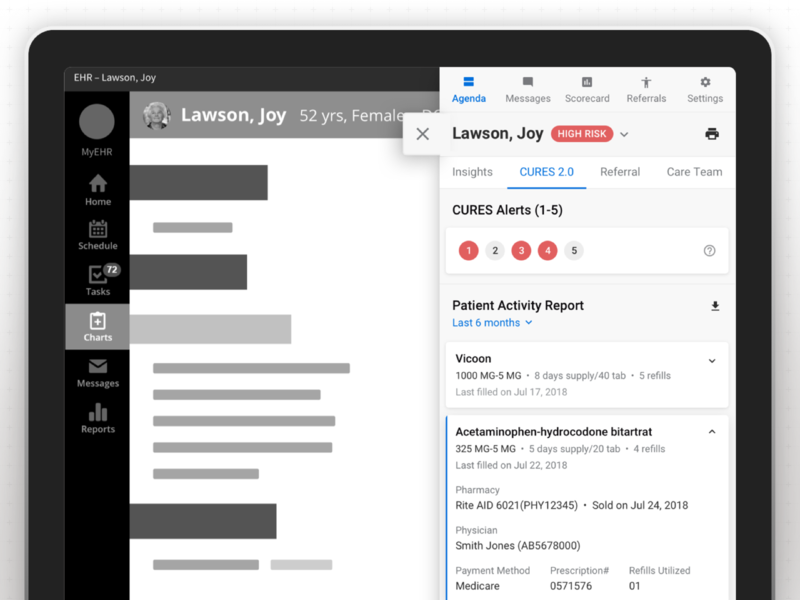 Apart from CURES insights, InNote also delivers actionable patient information such as due measures or screenings, dropped codes, patient education opportunities, and risk scores at the point of care. InNote also enables physicians to keep track of their own performance via concise scorecards, learning about their value rank across the network, the number of care gaps closed, cost efficiency, and the patient loyalty across lives managed. InNote is a part of Innovaccer’s existing suite of solutions- the healthcare data platform, InData; care management product, InCare; and analytics product, InGraph.